A daughter of a care home resident with Alzheimer’s, who was assaulted by a care worker, has told how the attack has destroyed her trust in the system. Amanda McAllister was speaking outside Ballymena Magistrates’ Court where Mary Christine Finlay, 45, who worked at Ben Madigan Care Home in Newtownabbey, was given a four-months jail term for assaulting 71-year-old Henry Kenneth Smith. 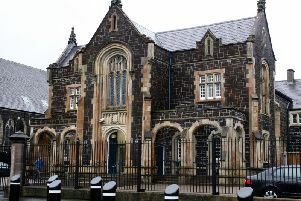 Finlay, with an address at Bawnmore Drive, Newtownabbey, was also sentenced for a second charge – ill-treatment of the victim – relating to the same date, March 25, 2017. She had previously contested the two charges but was convicted and was in court yesterday for sentencing. She has been dismissed from her job. A prosecutor told the court that in March last year a report was made to police that a care worker at Ben Madigan witnessed another care worker – Finlay – “slap a resident forcibly round the head”, and there were also allegations of “very inappropriate language” being used. The prosecutor said the complaint was made by a care worker after her “first day working there”. Handing down the jail term, Judge King said he had to take into account the “position of power” Finlay had over the resident. The defendant was released on her own bail of £500 pending appeal. Mrs McAllister said: “She deserves the sentence, rightly so, because my dad has nobody to stick up for him, only us. We are his voice. “We would never have known if it wasn’t for the whistle-blower, an agency care worker, who was there for the first night. Mr Smith has been at the home for around a year and a half and is still there.